Have you just purchased a shiny, new television for the lounge, rumpus, media room or bedroom? Perhaps you have bought a matching sound system to give you and your family a true cinema experience. Kore Communications can install your new flat-screen digital television, your surround sound or audio system and your digital gaming platform and ensure that it is set-up, fully integrated and operating to its full potential. Whether it’s an LCD Flat or Curved Screen, a new OLED Screen or a Plasma Screen we can help you. Connect all of your existing and new components to your TV, including– BLURAY, DVD, Cable or Pay TV, Gaming Device, Audio and Home Theatre System. When we have completed the installation we will tune you television and test all of your connected devices. We will also demonstrate the operation and integration of your equipment. Wall-mount brackets can be supplied to your requirements or we can install your pre-purchased equipment. Kore Communications also carries an extensive range of accessory cables at competitive prices to support the most complex installation. We also offer cable concealment where possible to ensure the most professional, uncluttered finish possible. Fixed price quotes available for large jobs over one day. It isn’t always easy to get that look, sound and feel for you’re looking for in home entertainment. Let Kore Communications help create that "theatre experience" you’re looking for without blowing your budget. We are experienced in the design and installation of home theatre systems (big or small), including the proper placement of speakers (wall or ceiling – surface or flush), projectors and screens, flat panels and other electronics in your media room or lounge room. Let us transform your dreams into reality. Call us now – we’re always happy to answer any questions you may have. 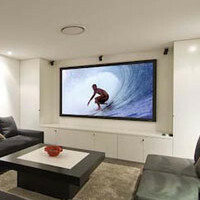 Home theatre systems can be a little daunting to set up – so why not let us handle it for you? – We can setup and program your system and tidy up any cables. -Surround sound setup is also available for wall or floor mounted traditional book shelf type speakers. We supply, and install projections systems to suit your needs. Designs can include motorised projector lifts, motorised projection screens, and a commercial grade projector to suit. A well Installed projection system can really enhance the audio visual experience for your clients. TVs and LED displays are the most noticeable component of any commercial Kore Communications which makes the mounting position and mounting type a critical factor in any installation. We have TV brackets to suit all screens from fixed brackets to swivel arm brackets to ceiling mounted brackets. IP Installs can give your venue the ideal visual display solution with a professional TV mounting installation.